Wabash President Patrick White has named Greg Redding the College’s new Faculty Athletic Representative. Dr. Redding, associate professor of German, assumes the position held for more than a decade by Professor Tobey Herzog. Redding, a German major and 1988 Wabash College graduate, was a member of Wabash’s cross country team as a student. He later earned his master’s degree and Ph.D. in German literature from the University of Cincinnati. Prior to returning to teach at his alma mater in 2002, Dr. Redding taught in the German Department at Washington and Jefferson College, where he served as the school’s men’s and women’s cross country coach for five seasons. “We are fortunate at Wabash that the faculty and the athletic department have a shared sense of purpose, and on one level all I need do is maintain the strong faculty-coach relationship that Tobey and his predecessors have cultivated over the years,” said Redding. Redding is an avid runner who specializes in ultra-marathons ranging in distance from 50 to 100 miles. In fall 2011, he taught a Freshman Tutorial that studied distance running through the lens of the liberal arts. In that course, his students had the opportunity to run with — and learn from — famed German-born distance runner and author, Bernd Heinrich, who wrote Why We Run: A Natural History. 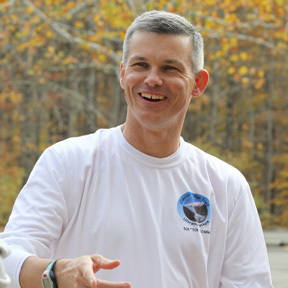 Redding also ran with his students on their final exam project — the Tecumseh Trail Marathon on December 3. Redding begins his responsibilities immediately.